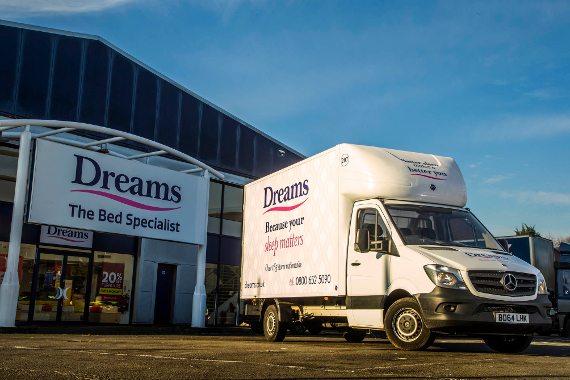 Dreams, the bed experts, has boosted the efficiency of its home deliveries with Paragon’s Home Delivery System (HDX). With 12,000 deliveries a week, Dreams uses Paragon HDX to plan all its nationwide routes and schedules from its head office. The system provides a selection of optimised delivery days and customers choose the one that suits them at the point of sale or when they make an online purchase. “When a Dreams customer buys a bed our Microsoft Dynamics NAV system will calculate the earliest availability for the product. This information feeds through to Paragon HDX, which then works out the available delivery dates to offer the customer. The information is presented graphically to our sales staff in red, amber and green, with green being the most efficient delivery,” says Ian Clarke, Change Controller, Dreams. To cover the whole of the UK, Dreams currently operates eight home delivery depots, with its ninth depot opening soon. The new depot will be in Scotland. The deliveries are made using the company’s fleet of 100 x 3.5 tonne Mercedes Sprinter vans. “Paragon HDX completely eliminates all manual elements from our delivery planning. It gives us much tighter control of how many vans we need and the number of driver shifts required to achieve the plan. Together with our stock availability system, we have a much clearer view of our supply chain as we can plan when goods need to be in the depots and we’re now running some as stockless, having just the items they need to deliver within the next 48 hours,” says Ian Clarke. Seamless integration with the GPS vehicle tracking units in the vans using Paragon Route Execution allows the system to monitor delivery progress in real-time. This provides a live report feed, which is published on the Dreams intranet to show how deliveries are progressing and allows customer services to keep customers updated with ETAs. They can see the exact status of each delivery, whether the van is at the customer’s home or has completed the delivery and is on its way to the next drop.